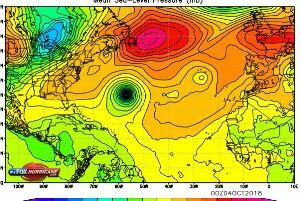 Meteorologists have confirmed Hurricane Lesley is moving towards Derry and the rest of Ireland. Met Eireann meteorologist John Eagleton confirmed Hurricane Leslie was moving towards the Republic of Ireland. The weather system became an official hurricane on Wednesday afternoon and is currently out over the mid-Atlantic Ocean area . "Some models suggest Leslie will track south of the UK while others suggest it may move close to the UK by the end of next week," said a spokesperson for the Met Office. “It’s much too early to say whether it will have any impact on the UK as we don’t know yet how far across the Atlantic it will come. “It could have an effect on our weather but we don’t know where it will go after it reaches the US. "It’s likely to move onto the eastern coast of the US as a hurricane and as it loses strength it will move towards Europe but we don’t know what it will lead to, it’s far too early to say," the spokesperson added.